I’ve stumbled upon a very talented portraitist of Armenian origin, Onnig Cavoukian. Apparently he is well known in his field, but I only recently discovered his work and decided to share. Here’s a little about him. 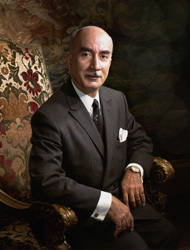 During his career, Cavouk’s subjects included Indira Gandhi, the Queen Mother, Queen Elizabeth, Oscar Peterson, Pierre and Margaret Trudeau, Leonid Brezhnev, Patrick Macnee, Hubert Humphrey, and Pat Nixon. Three Canadian stamps have been made from portraits by Cavouk, of Roland Michener, Maureen Forrester, and Sam McLaughlin respectively. Here are some examples, but visit his official site www.cavouk.com for more. This is not Onik Cavoukian, this is his father Arto Cavoukian. Who was born in 25.12.1915 Mersin, Kilikia. And died in Torronto 1986. Whatever you put in this page is Arto Cavoukian’s works. Make it right.